A great map that summerizes the entire leveling process. A summary of entire leveling process 1-85. A great guide. I would highly recommend following it. The only issue is with Worgen. They start off in Gilneas, but after they escape the city, they are sent off to Kalimdor, so they should be following the Kalimdor Part 2 path. EDIT: So please explain why you're downvoting this. Do you disagree that Worgen are sent of to Kalimdor after their starting zone? Or do you think I was wrong in calling it a great guide? You still haven't mentioned in the Alliance Eastern Kingdoms starting section that Worgen get sent off to Teldrassil and they should choose from the Alliance Kalimdor section for where to go next. Other than that, an excellent guide. I use it all the time. 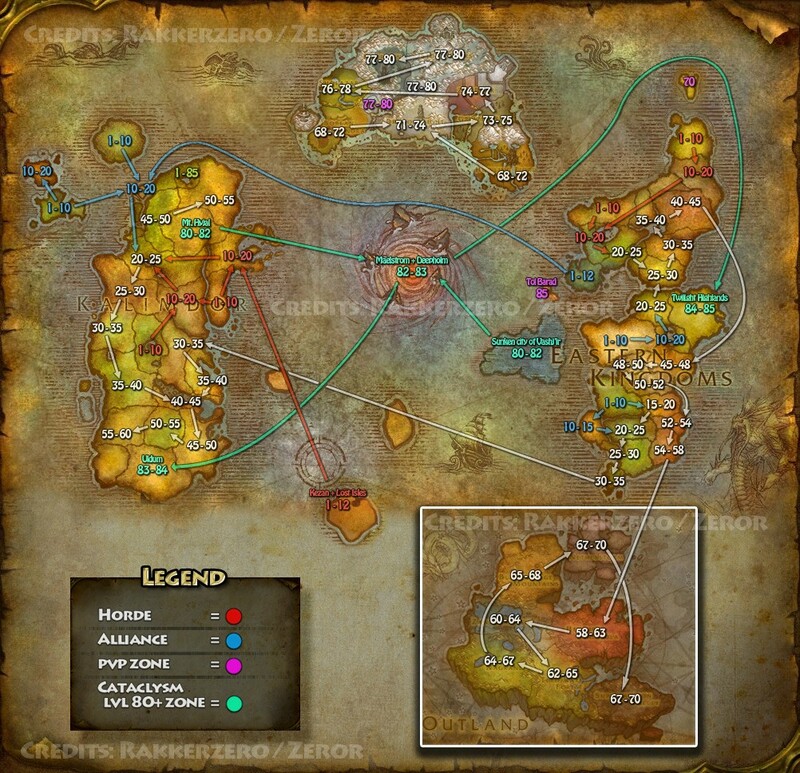 Just to add (for the benefit of those new to the game) that even if you play a NE, Draenei or Worgen toon from the beginning, at level 12, you still have the option of the Eastern Kingdoms path, as a boat goes from Rutheran Village (which can be easily accessed from either starting zone, albeit at a price for Draenei toons) across to Stormwind City, and you can easily head to whatever EK second zone you want from there. I did the Westfall story with my NE Druid toon, and as the OP says, it's a lot of fun with a very surprising ending! The fastest way to lvl a Tank of Healer ,your new toon, is by questing till lvl 15 and then on till lvl 60 just run random dugeons, takes the average player faster. This was a lot of help thanks! Mhmmm,this one looks helpful... Button. allthough this is a very nice guide. i suggest going dungeons untill you reach lvl 55ish especially if you get the dungeon quests its really worth it. especially if you have heirlooms and its not your first character but that would mean taking a big hit on lvl professions. This is a pretty good guide. Tbh though, I had a lot of money issues in wow and a lot of the advice people gave kinda...sucked. I actually a couple of bucks to throw around so I just decided to buy a gold guide lol. it actually helps if you dont care about the cost and willing to put some time in it. Haydens is the one. cheap i think and worth it. We've revised this guide with a section on Dungeons, general tips, and more details on cool things in each zone. Enjoy! i just used the guide through http://aee0e2wdq0g5hm91qwfy4s0m3m.hop.*! @#$%^&*.net/ to level up. It's easy as hell. Thank you for mentioning my guide. Much appreciated! Thank you, this is a very helpful and informative guide...I'll be referring to it often! I'm currently in the middle of working Bloodmyst Isle with my newly created Retri Pal Draenei toon, however I'm debating on whether I should finish Bloodmyst Isle or head on over to Darkshore. Upper Blackrock Spire is no longer a low level dungeon. Very useful guide! Had a lot of fun with the Westfall storyline. It is 2016 and the guide is still fantastic! As a noob, I try and visit this guide any time I start a new zone. Thanks! When I typed "wow leveling guide" into google this guide was the first link that popped up. In a nostalgic way it really warmed my heart. Thanks for putting all of this in the one place - *so* handy! Hey if any of you guys are interested, there's this leveling guide I found if your interested. Last I checked, Deadmines weren't in Kalimdor. Fyi, i did a check, i was able to enter Razorfen Downs as low as level 32, so i am not sure how many of the dungeons are inaccurate. I was able to just pick up quests from NPCs guiding me to the next level zone, but I don't really see a quest like that in Silithus. The only quest I have gotten like that, in Silithus, was to Blasted Lands, which is the same level range. Is there any quest here that will lead me to Outland or Northrend?